Note: In my previous post, I introduced the "Families from Asch," emigrants from Austria's Bohemia who settled in Little Rock, Arkansas, from 1848 to 1857. 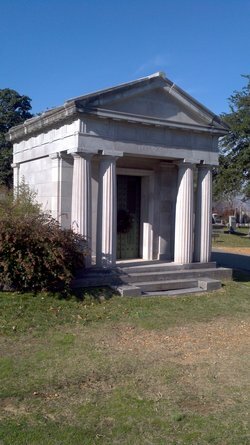 This post is a biographical sketch of one of them, Charles F. Penzel, who became one of Little Rock's most successful businessmen after the Civil War. Charles Ferdinand Penzel emigrated from Austria to Little Rock in 1857 and after the Civil War became a leading merchant, pioneering banker, and prolific investor who rose to the first rank of capitalists in the city. Beyond his widespread business ventures, he was active, often as an officer, in numerous city economic development, religious, civic, and charitable organizations. 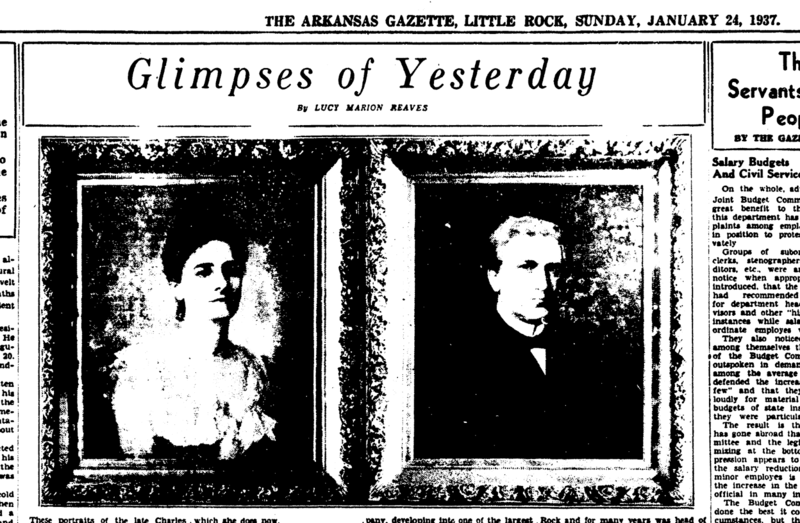 At the time of his death on February 16, 1906, the Arkansas Democrat observed that he was, perhaps, the richest German-American in Arkansas. Born on October 8, 1840, Penzel was one of twenty-eight emigrants from Asch, a Bohemian city of about 9,000 and a district of about 20,000 people, who settled in Pulaski County between 1848 and 1857. When he arrived in Pulaski County, his parents and older sister Anna Katharina were living on farms near Granite Mountain. His sister had emigrated seven years earlier, in 1850, with her soon-to-be husband Christopher Reichardt, who also was from Asch. 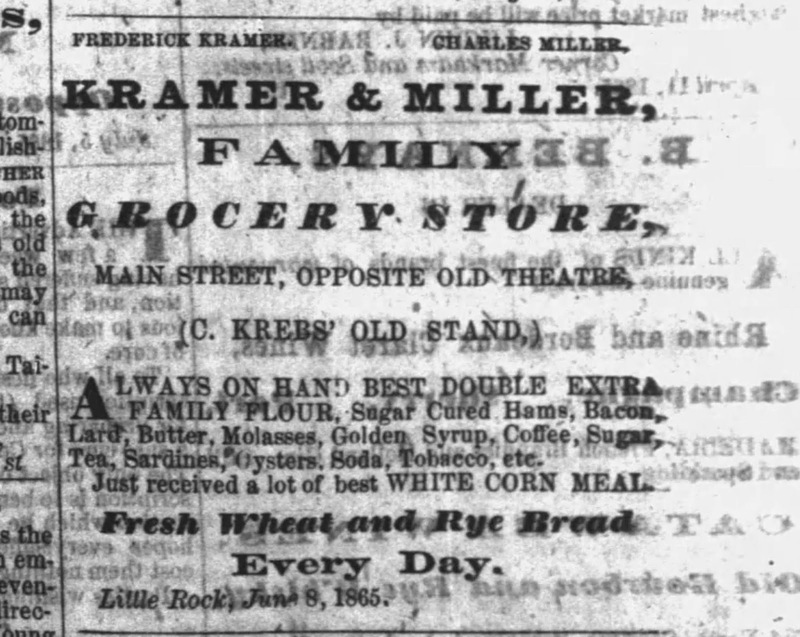 In May 1865, the war over, Penzel returned to Little Rock and worked as a bookkeeper for the Kramer and Miller Family Grocery Store and Bakery. The store owners, Frederick Kramer and Charles Miller, were German immigrants and brothers-in-law: Kramer was married to Adelina Reichardt and Miller to Fredericka Reichardt. These women, from Asch, were the sisters of Christopher Reichardt, the husband of Penzel’s sister. The grocery store had opened in November 1863 after union troop occupied Little Rock, and it flourished. In early 1868, it moved from Main Street to a newly constructed three-story building at the corner of Markham and Commerce Streets, near the city’s ferry landing. As the move took place, Penzel became a partner in the firm. 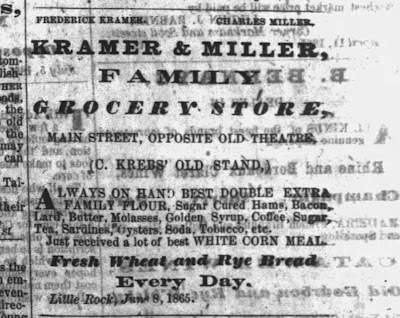 Kramer sold his share of the grocery store in 1872, and its name was changed to Miller and Penzel. On August 28, 1875, Miller died suddenly. 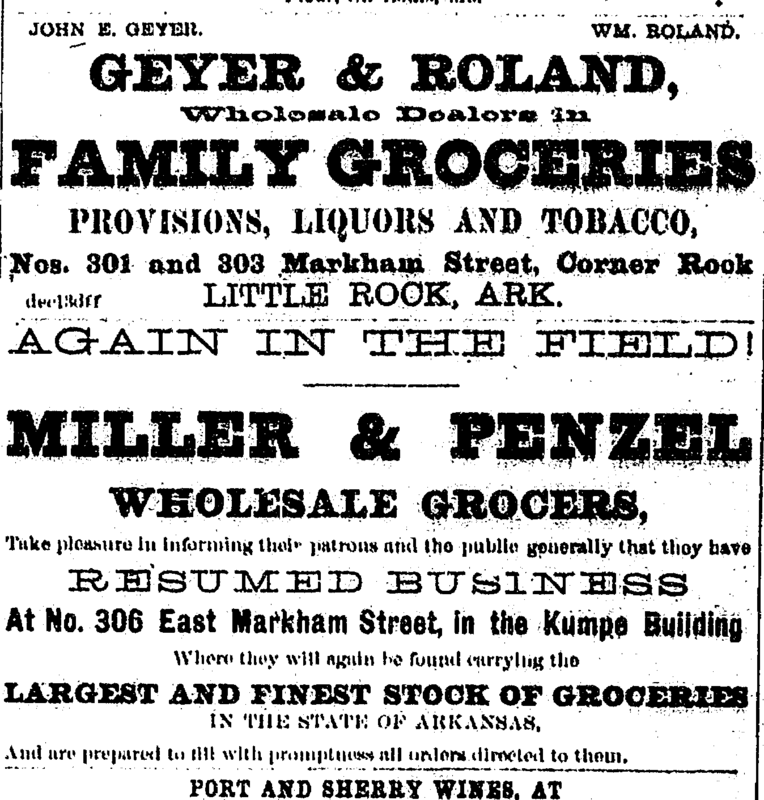 Penzel continued to operate the store, but in December 1876 – before Miller’s estate was settled -- the building and most of the store’s merchandise were destroyed in a fire. Penzel quickly resumed selling groceries in a nearby temporary location. 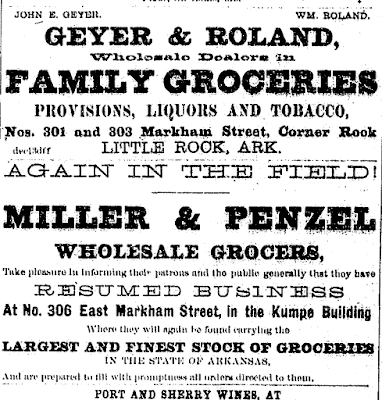 In August, 1877, he reopened the store in a new building at the old location, and a few months later he bought Miller’s share from his estate and changed its name to Charles F. Penzel & Co.
After Miller’s death, Penzel had hired George Reichardt, also an emigrant from Asch and the brother of Fredericka Miller and Adelina Kramer, to help manage the store, appointing him in 1882 the store’s secretary and treasurer. Reichardt remained an officer of the firm during most of the years that followed and was its president after Penzel’s death. 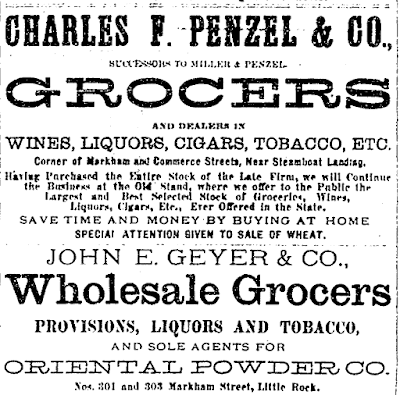 In 1886, Penzel changed the firm’s name to Charles F. Penzel Co. Grocers and later incorporated it. That name remained until 1922, when the store was sold to the American Wholesale Grocery Co. 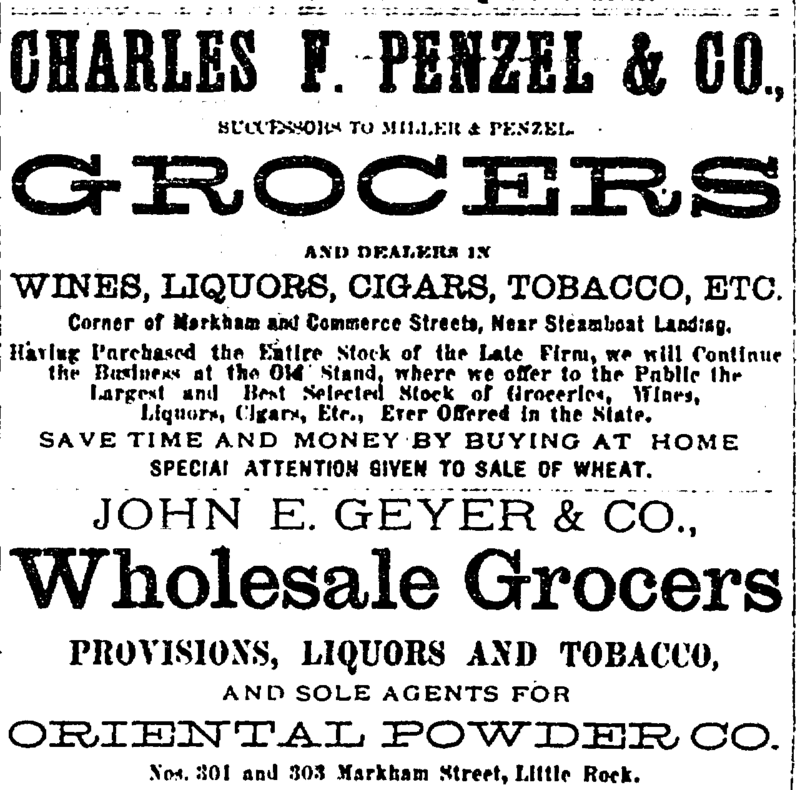 In addition to the wholesale grocery business, Penzel developed a multitude of other business interests. In 1870, he invested in the city’s first building and loan association, and for the rest of his life invested in, and served as a director of, such financial associations. In 1875, he helped create the German Savings Bank, only the second incorporated bank in the city, and served as the bank’s first president, holding that office until 1883. Under his leadership, the bank became one of the city’s most trusted and successful financial institutions. Penzel was appointed president of Exchange National Bank in 1885, a position he held until February 1888. The next year, he became president of Guaranty Trust Company, a small savings bank making real estate loans. In 1893, he again became president of Exchange National Bank, a position he held until 1903. A year later, he was elected president of the Arkansas Bankers Association. Beginning in the last half of the 1870s, Penzel expanded his business interests. He started a manufacturing company that milled flour, another that made soap, and still another that built barrels. He co-founded the Little Rock Street Railway Company to operate a streetcar line. He was a director, and often an officer, of companies engaged in diverse businesses, including insurance, railroads, street cars, utilities (gas, gas lights, electricity, and electric lights), and river shipping. 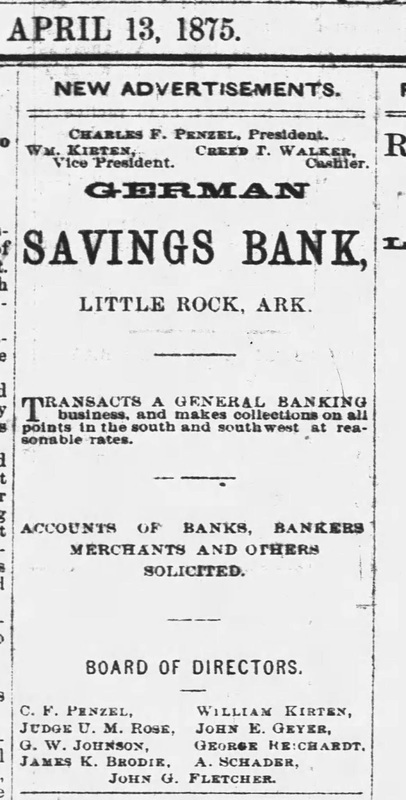 Also, he dealt in cotton and lumber (he was president of the Arkansas Lumbermen’s Association in the 1880s) and invested in mines, bridges, rural land, and Little Rock real estate (he was co-owner of a large subdivision that opened in 1889). From the start of his career, Penzel promoted local businesses. He joined the city chamber of commerce at its creation in the late 1860s and in 1880 led an effort to revitalize it. In the 1890s and early 1900s, he was a local Board of Trade officer. Also, he was among the businessmen who created a Cotton Exchange and undertook other initiatives to improve Little Rock’s cotton trade. Further, Penzel spoke out for merchants, pressing the city government to operate more efficiently, demanding that federal regulators enact fairer tariffs and railroad shipping rates, and weighing in on other important public policy issues. In addition, Penzel supported, and often led, efforts to create tax districts to upgrade local streets, drainage, and bridges and to build new water and sewer systems. Outside of the business world, Penzel played a leading role in Little Rock’s German Lutheran Church and its construction of a grand house of worship. In 1868, soon after the church came into existence, he was elected its first secretary. Later, when the Lutherans constructed a new church building, opened in 1888, he was cited as one of a half dozen people who had contributed the most to its completion. Although he was a member of the church until his death, in his later years he attended the Presbyterian Church. 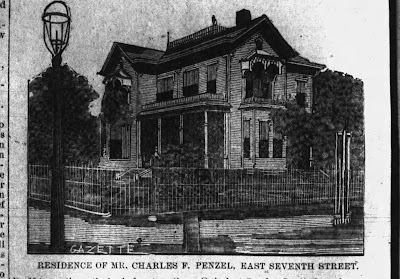 Among Penzel’s many charitable activities, he and his wife led efforts to acquire and operate a home for Little Rock’s orphans. He was on the board of directors of many organizations assisting the poor, such as the Relief Association, the Children’s Aid Society, and the Old Ladies Home. Also, Penzel helped found the city’s humane society and was for several years its president. In addition, he was an officer of state and local confederate veterans groups. Despite his outsized role in Little Rock’s civic life, Penzel joined no secret societies, such as the Masons, that were then popular with businessmen. Penzel had an interest in local politics, but rarely engaged in party affairs. He became a United States citizen on August 3, 1866 and registered to vote in 1867. The democratic party nominated him seven times to serve as a Justice of Peace on the Pulaski County Court, and he was elected each time. Penzel married Rosa A. Eisenmayer (1850 – 1938) of Illinois, the daughter of German immigrants, on January 1, 1873. They had three daughters: Hedwig Penzel [Forsyth] (1873 – 1939), Hildegard Penzel [Wright] (1875 – 1953), and Marcella Penzel (1883 – 1976). The family often entertained Little Rock’s social elite at lavish parties held in its home. In his private life, Penzel was a cultured, disciplined, and sober man who enjoy writing poetry and traveling. A colleague noted that although he was “decidedly forceful in all business,” he was “a quiet, modest man." Following his death on February 16, 1906, Penzel was buried at Mt. Holly Cemetery in a large marble mausoleum, designed by architects George R. Mann and Aloysius Downey. Among his descendants is great-grandson Charles Penzel Wright Jr. who in 1998 won the Pulitzer Prize for poetry and was the United States’ poet laureate in 2014-2015. “Charles F. Penzel Died Suddenly.” Arkansas Gazette, Feb. 17, 1906, p. 1. 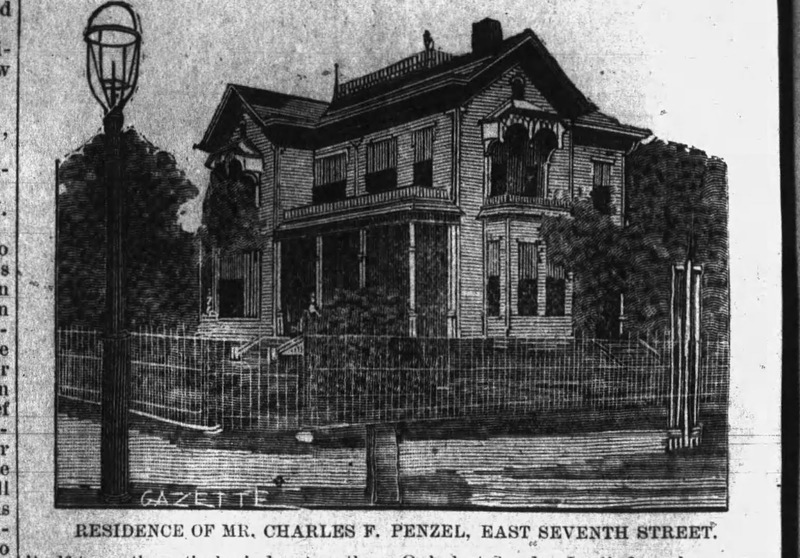 “Death of Charles F. Penzel.” Arkansas Democrat, February 16, 1906, p. 4. Necrological. 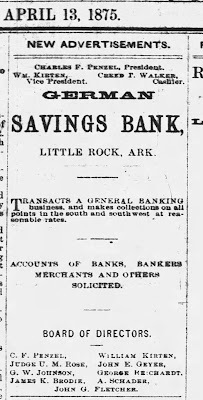 Arkansas Democrat, Feb. 18, 1906, p. 2. 113, Winter, 1989 (accessed on-line). Penzel, Charles F. papers, Arkansas State Archives, Little Rock, Arkansas.